In Part 1 of this blog series, we looked at how the exit environment for software companies has been evolving into a continuously stronger M&A market that is seeing both high transaction volumes and high price levels. We can now dive in a bit deeper in picking apart the drivers behind that second part - pricing. At a high level, there are four key price drivers in play when discussing the price of a deal – the sheer availability of invest-able capital, the market recognition of strong company fundamentals, the favorable debt markets, and the opportunity to unlock strategic value. There is a reason this goes first, as it is hard not to recognize the unprecedented capital availability in the technology space. On the strategic side, just the combination of Apple, Microsoft, Cisco, Google, and Oracle’s balance sheets represents some $650+ billion of cash reserves. On the financials side, the Top 10 software acquirers have raised $80+ billion dollars over the past 5 years at an ever-increasing pace. There is a separate argument to be made around the expected investment returns with so much cash sloshing around, but what cannot be denied is that the sheer size of the dry powder puts an upward pressure on deal prices. This is not to say that the excitement around technology companies is unjustified. If you had invested in the S&P 500 in 2008, by September 2018 you’d be looking at a 105% return on your investment. For the same period, the NASDAQ would have brought home a 223% return. If you had, however, deployed your capital into publicly-traded SaaS companies, you would be looking at a return of a whopping 646%. Which, conveniently, brings us to our next point – market support. Tech companies, and Software-as-a-Service companies in particular, benefit from predictable revenue streams, recurring contracts, high gross margins, and favorable cashflow profiles, and public markets have recognized that. While the historic revenue multiple range of 4x-8x might seem broad, it shows both strong faith and relatively low volatility in the underlying value of publicly-traded SaaS companies. In fact, even in the middle of the 2008 financial crisis, revenue multiples were depressed for only a few quarters and bounced back to pre-crisis levels around mid-2009. This intrinsic value has been recognized by financial buyers as well. Historically, a decent portion of private equity software deals revolved around slow-growing or distressed assets. As financial buyers have begun looking at momentum-driven, recurring revenue companies that can benefit from both operating expertise and cross-portfolio synergies, they have moved up-market in terms of quality (which has its associated higher price). Discussing financial buyers’ ability to pay up is incomplete without one, sometimes overlooked, factor - the availability of debt financing. Strong debt markets over the past decade have given PE investors the ability to apply higher degrees of leverage on their companies. On a case-by-case basis, this leads to either better ROE, or (more often) an ability to compete at a higher price. Since 2011, PE shops have, on average, been able to add an additional turn of leverage on their acquisitions, and in the past few years, the debt markets have held fairly steady, supporting the higher deal price levels. A final, yet significant, point to be made about the strength of the tech M&A market comes from the strategic value that these acquisitions can unlock. A lot of innovation is still driven by startups and to the extent that continues, they will always be the focus of acquisitive attention. While this case for strategic acquirers is well-known, in recent years we have seen hints that there may be strategic value to unlock even for financial buyers. The immediately evident play here is the add-on strategy, in which PE portfolio companies are effectively acting as strategic acquirers. For example, Vista Equity Partners portfolio company MediaOcean acquired Zanthuu, Videoamp, inVision, Colspace, and BCC AdSystems, all in just under two years. There is also an argument to be made about intrinsic synergies in the broader portfolio. In Vista’s case, MediaOcean, Cvent, Lithium, MarketTrack, Integral Ad Science, and (until recently) Marketo are separate entities with differentiated products, but all form part of most the CMO's technology stack. In fact, there are many market segments (cybersecurity, human capital management, compliance) where a handful of companies can provide a full suite of solutions for the category. The ability to gain a better understanding of market (and even customer) dynamics that comes with such a full suite can carry some significant value. If those synergies pan out, financial buyers will likely continue to act increasingly more like strategic ones and the lines between the two will blur. 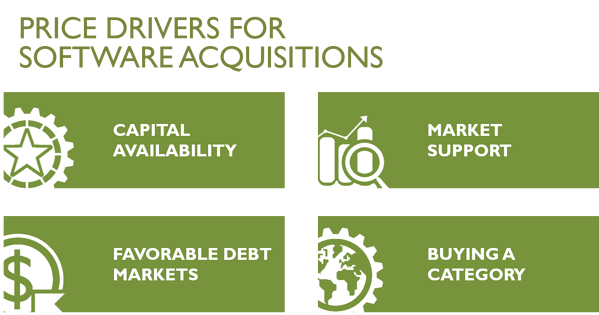 The confluence of these four factors is resulting in a more favorable M&A environment, but there are still a number of issues to consider. On a more tactical level, there is a careful orchestration and sequencing that need to occur for companies to realize their maximum value during a sale process. On a more strategic level, the increase in financial buyer acquisitions means that one firm’s exit is increasingly often another firm’s initial investment, which comes with its own set of expectations and hurdles to clear. Nevertheless, it is easy to see that we live in interesting times. The private market for technology deals is as good as it has ever been, with both strategic and financial buyers vying for the best assets. 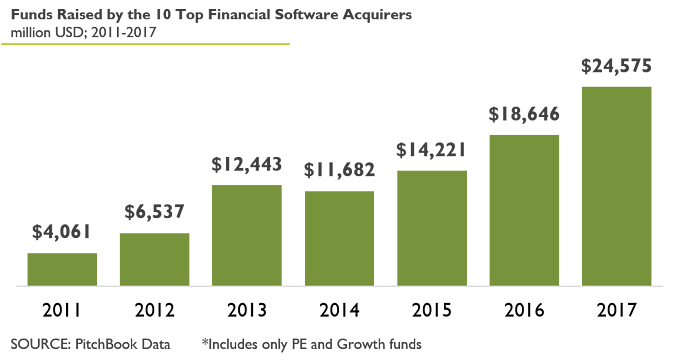 The increased competition, combined with the faith in the SaaS business model, are resulting in favorable financial outcomes for companies that are hitting the market. Here’s to hoping that the trend continues.